Organically grown: Karen Cancilla's gro-O franchise is flourishing. In 2008, after being in the insurance industry for 20 years, Karen Cancilla sold her brokerage and settled into semi-retirement. Health issues convinced her to switch to an all-organic diet. But after a few weeks of valiantly munching pesticide-free tomatoes, broccoli and kale, she was fed up. "All that food lasted only a day or two before it spoiled, and it's really expensive to buy at the store," says the 50-year-old mother of six. "I started to wonder if other women my age were experiencing the same frustration." To save money and ensure her produce was truly organic, Cancilla planted a garden at her home in Alta Loma, Calif. A few months later, while harvesting her homegrown goodies, it struck her: Lots of busy people would like to eat more organic veggies but don't have the time or skills to grow their own. So why not build and maintain gardens, and even harvest the produce, for them? That's how gro-O, which now has six franchisees in California, New York and Florida, was born. The franchise installs raised-bed gardens--filled with a "weedless" soil mixture designed by Cancilla's son and a hired botanist--and fills them with seedlings. Prices range from $250 to $1,100, based on style and size. 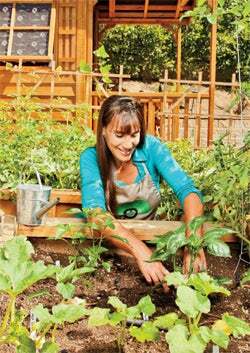 While 80 percent of customers get gardens for their homes (some with a monthly maintenance plan), she has also created organic plots for schools, nursing homes, hospitals and businesses. We offered Cancilla a couple of carrots to tell us how gro-O works. About 80 percent of our clients are women between their early 30s and 55. They're moms of little kids and want to teach their children to eat correctly. They know that when the kids help grow their food, they're more likely to eat it. And women my age, with children who have moved away, need something to nurture. We feel we've got our target right. How much of the business is maintaining the gardens? About 30 percent of people we build gardens for become maintenance clients. We want to increase that to 50 percent, because the success rate when we run the garden is great. Is there a bigger purpose to urban gardening? are going to cause us to have to do that in very small spaces in cities. So really, it's an emergency-preparedness thing. Once you get in the door and say, "Look at the beautiful garden you can have," then you can turn the topic to emergency preparedness and agricultural toxins and other subjects. Does gro-O have other revenue streams? We started offering six- or 12-week after-school programs in gardening last fall, teaching kids to grow food. It's really, really awesome and can be used anywhere in the country, even indoors. We also have direct sales, like a garden party, where people sell organic gardening supplies. And we're also looking into creating a line of premade organic family meals that franchisees can add on as a delivery service. Do you still enjoy gardening? I never want to stop gardening, and I don't want to end up in front of a computer all the time, so I go on rounds four days a month to maintain gardens. It's given me big muscles. I just turned 50, and I'm thinner than I have ever been. It's a great aftereffect. I've learned to love Brussels sprouts. I thought I hated them, but this past winter I grew them, cut them in half, coated them with olive oil, salt and pepper and broiled them. They are so good. I just eat them like snacks. What's your favorite garden so far? I was sitting with my grandma, who recently turned 100, at her nursing home. All of a sudden I said, "Do you want a garden?" She lit up and started rattling off the vegetables she wanted. She wasn't talking so much, so the fact that she got so excited was great. A week later, some friends and I put it in as a Valentine's Day present. My grandma started getting up and getting dressed again. She wouldn't remember my name when I visited, but she would remember she had a garden.